Sweet and tasty Apple Italian Charm is cute and colorful piece. 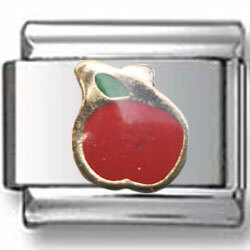 The apple is painted in red and green enamel and set on a shiny stainless steel link. The finest steel link is wonderful and had base for this marvelous charm.